The Second World War is vanishing into the pages of history. The veterans were once all around us, but their numbers are fast diminishing. While still in their prime many recorded their memories with Peter Hart for the Imperial War Museum. As these old soldiers now fade away their voices from the front are still strong with a rare power to bring the horrors of war back to vivid life. The 2nd Norfolk Regiment were a proud old regular battalion honed in the pre-war traditions of spit and polish at their Britannia Barracks in Norwich. Sent to France they sold their lives to gain time for the retreat to Dunkirk when surrounded by an SS Division at Le Paradis in May 1940. Over 100 of the survivors would be brutally massacred. Back in England they reformed from ordinary drafts of men called up from all over the country. A new battalion was born. Sent to India they met the Japanese head on in the bloody fight for Kohima against the Imperial Japanese Army. As the fighting raged in the jungle the Norfolks were once again right at the very sharp end of modern war. This is their story. 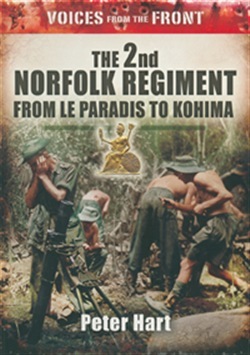 Acquista The 2nd Norfolk Regiment in Epub: dopo aver letto l’ebook The 2nd Norfolk Regiment di Peter Hart ti invitiamo a lasciarci una Recensione qui sotto: sarà utile agli utenti che non abbiano ancora letto questo libro e che vogliano avere delle opinioni altrui. L’opinione su di un libro è molto soggettiva e per questo leggere eventuali recensioni negative non ci dovrà frenare dall’acquisto, anzi dovrà spingerci ad acquistare il libro in fretta per poter dire la nostra ed eventualmente smentire quanto commentato da altri, contribuendo ad arricchire più possibile i commenti e dare sempre più spunti di confronto al pubblico online.